Price is for three (3) bags. 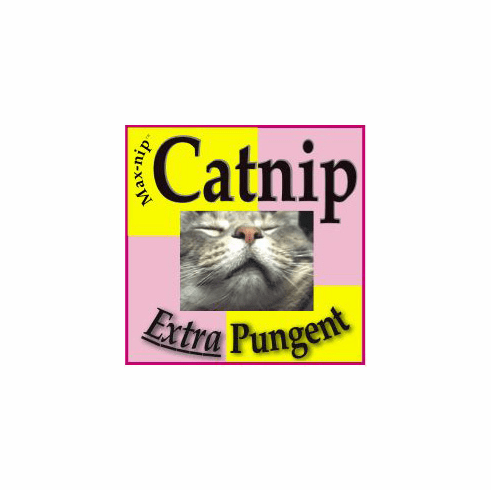 Max-nip� brand catnip was named for our daughter�s 18-pound gray-striped tabby and is the treat of choice for our beloved office felines. After reading about the pesticides used in commercial catnip, our youngster was concerned about catnip coming from unknown sources. �Max� was consuming catnip while playing and she wanted only organically grown herbs for her precious friend. In light of this, we made arrangements with a certified grower/supplier from the days when we owned a herb farm. Both Max and his sidekick, Bruce (our gray and white, part-Siamese stray) showed much more interest in Max-nip� than in any of the pet store brands, because of the freshness of the herb and our storage techniques. We have sold this popular, pure blend of chopped leaves and buds (no sawdust filler) at the flower shows for many years and our then-young child learned about �product evaporation� early one morning, long ago, when a couple of rather �stoned� kitties were amidst a sea of leaves and torn bags. (Catnip should be kept securely away from tooth and claw in the fridge.) For those of you who have been receiving our print catalogs for several years, "Max the Cat" was featured on the front cover of our Fall Reference Guide in 2002 and of February 2014 he was 18 years old and still loveing his 'nip. Kitty needs catnip right away? Postage if sent separate from bulbs is $5.00 for 3 bags, plus the cost of the catnip, otherwise we'll simply enclose it with your bulb order at no additional cost. If you want a greater quantity, please let us know under "comments" during checkout and we'll adjust your total. Why is Max-nip� Catnip better? Sprinkle small amount of 100% Organic Max-nip� on scratching post, carpet or favorite toy. Put a tablespoon into an old sock along with some "crunchy", crumpled paper, knot the end, and watch the fun! Seal bag in recycled glass jar to maintain freshness and to keep kitties from helping themselves unattended. Each bag, 12 gr. net weight, is about one-half cup in volume.